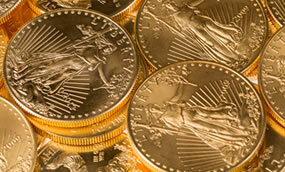 One thing this news article got right on Valentines Day is that gold is rallying on hot headline inflation report. What it gets wrong is that gold has been rallying just a couple of times recently and on a tempory basis. Quite the contrary gold has been on the move since late December 2015 as inflation has been pushing through mainstream media's fabrications. Rising yields, in theory, should detract from the appetite for gold because precious metals don’t bear a yield. However, rising inflation could also provide a lift for gold over the short term because it is often viewed as a hedge against rising prices. Gold had been improving over the last few days after the futures contract erased 1.6% last week in its worst performance in two months. “In this case [after the data], we could see a renewed wave of selling on the stock markets for fear that the Federal Reserve might raise interest rates faster and more sharply. This could spark a renewed flight into safe havens, which would benefit gold,” said Carsten Fritsch, commodities analyst at Commerzbank. As of this update, gold is up $25.00, first new highs for 2018 and the biggest hedge fund in the world CEO Dalio just poured millions more in the precious metal.